Sielski: Will Hall keep Iverson out? 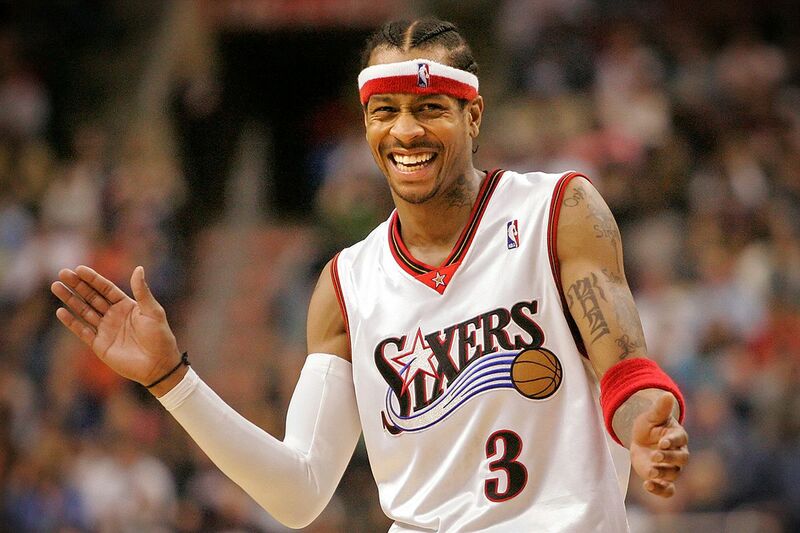 Allen Iverson is among 14 finalists for induction to The Naismith Memorial Basketball Hall of Fame this year. The Naismith Memorial Basketball Hall of Fame revealed Friday that Allen Iverson is among 14 finalists for induction this year. And if there's a paucity of public debate over who among the finalists will get in and who deserves to, the indisputable credentials of candidates such as Iverson, Shaquille O'Neal, and Sheryl Swoopes are only part of the reason. The other part has to do with the selection process itself. The Hall has two screening committees, North American and women's, that were in charge of choosing those 14 finalists. The finalists will be reviewed by the Hall's Board of Trustees to determine if any of them "damaged the integrity of the game of basketball" before the board submits them to an honors committee, which will select which ones will be included in the incoming class. The honors committee has 24 members - including executives, media, and previous inductees, according to the Hall - but the identities of those members remain secret. So if Iverson should somehow not earn induction this year, presumably no one will know whether it was Iverson's infamous "practice" news conference, the vulgar and violent rap music he recorded in 2000, or his overall counterculture aspect that the committee members found too distasteful and damaging. The cloak-and-dagger nature of the process only reaffirms the Hall's rather dubious achievement. In a sport whose allure is largely based on the vibrant styles and personalities of its individual participants, the Hall of Fame has managed to strip much of the collective enjoyment and fascination from its selection process. It isn't much fun to discuss who's getting into the Naismith Hall of Fame - not as much fun to discuss who's getting into the Pro Football Hall of Fame, and certainly not as much fun to discuss who's getting into the National Baseball Hall of Fame. Those processes have their flaws, of course, namely this one: Anyone who calls himself or herself a working journalist has no business lobbying for a candidate's induction, as members of the Pro Football Writers Association do, and/or voting on a candidate's prospective induction, as members of both the PFWA and the Baseball Writers Association of America do. We're supposed to cover the processes independently - report on them, comment on them, recommend changes to them - not involve ourselves directly in them. But the upshot of those procedures is each one's relative openness. Those PFWA members who are selectors for the Hall of Fame often identify themselves as such and both account for their votes and demystify the process as a whole. Gary Myers of the New York Daily News, for instance, appeared on a national radio show last week and explained why former Eagles wide receiver Terrell Owens did not earn induction this year. "The bottom line on T.O. is he was so disruptive," Myers said on The Dan Patrick Show. "He tore teams apart." Similarly, BBWAA members have ready-made stories, columns, and blog posts available to them come November, when they receive their Hall of Fame ballots in the mail. It's a rite of winter for baseball writers to publish and defend their completed ballots, and the question of whether they should consider verified or suspected performance-enhancing drug use by eligible players only intensifies interest in the process and results. The Naismith process has none of that transparency and, hence, none of that intrigue. There's no reason, aside from a desire to avoid criticism and accountability, that the members of the Hall's honors committee should remain anonymous. Iverson isn't merely the greatest little man and arguably the most talented player in basketball history. (Think about it: To score at the rate that he did in the manner that he did, standing just 6 feet tall, he would have to be.) He is one of the sport's most memorable characters, for all the right reasons and all the wrong ones, and should he fail to be inducted this year or any year, basketball would be better and more interesting for allowing people to know who believed him undeserving of immortality, and why.